Why do I need legal assistance at the early stage? What legal issues should I address at this stage keeping in mind the future? How can I identify the right legal advisor or law firm for my business? These are three key questions early-stage entrepreneurs must ask themselves. Often, in the quest for growth and scalability of a business idea, founders (of startups) miss out on researching, forming and implementing key legal documents, which ensure a smooth journey for a startup in the long run. We can quote one too many instances where the absence of a legal framework has created a dent in the business or slowed its pace of growth. A classic example (popularized by the movie The Social Network) is the Winklevoss Twins vs. Facebook case, where Mark Zuckerberg entered into a verbal agreement with the twins to help create HarvardConnection in return for equity, while parallelly setting up TheFacebook.com. Closer to home, we often hear of disagreements between co-founders, because of lack of clear legal documents detailing the agreement between a startups’ founders or even with early-stage employees. Keeping such case studies in mind, in our first blog, we take a peek into the nuances of having a clear legal framework and strategy right from the early days. The first step, quite obviously, after you decide to startup is to figure out how you want to incorporate your company. As a startup, you can register your company as a private limited company, a sole proprietorship, a limited liability partnership (LLP), or a partnership. The co-founders must collectively decide the type of entity they want to form, keeping in mind the venture’s long-term plans. Right from the incorporation stage, we’d recommend you to work with a lawyer to get the documents in place. Each type of entity has its own advantages and disadvantages — in terms of tax, personal liabilities, future fund raising factors and so on. Even the location where you incorporate your company matters and expert opinion becomes crucial in all these matters. The second, crucial step lies in creating a comprehensible shareholder agreement with your co-founder or business partner. Today, more than ever, a lot of startups are founded with multiple co-founders on board. And, typically, a conflict between the founders arises when the business is either taking off or is on a downward spiral. In such circumstances, a co-founder agreement will come in handy. It should cover critical aspects such as the common goal of the company, the roles and responsibilities of each founder, the ownership percentage, the salaries that each founder is entitled to, the dilution strategy; who will dilute, when, the extent of dilution and more. The third aspect lies in the protection of core intellectual property. If you have a unique product, technology, platform or process, or if you are outsourcing part of the development to an independent developer or external service provider, it is vital to come to a clear agreement on who owns the code and content. In fact, it is advisable to create an agreement, which states clearly that the ownership lies with the company and not with the service provider you have engaged. The role of intellectual property, especially in technology-oriented businesses, is turning out to be extremely crucial in today’s world. 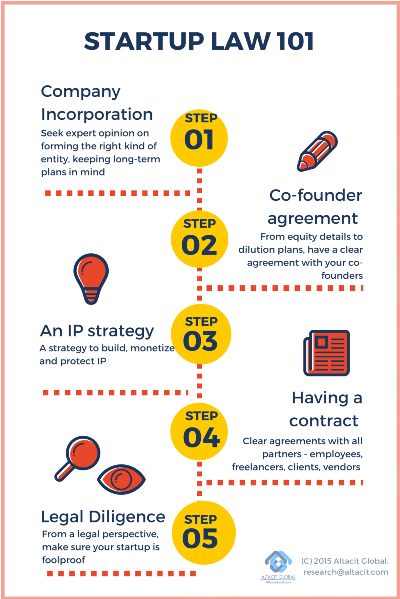 It is important to work with the right IP experts to file copyrights, trademarks and other forms of IP and even plan your future IP strategy. It is also crucial not only to create IP, but also to monetize and protect ones IP rights, and the right legal partner can make a huge difference in all these areas. The world of entrepreneurship has changed remarkably in the last decade or so. Companies are relying a lot more not only on full-time employees but also on part-time talent and even a network of partners. For example, large startups like Ola Cabs operate with a network for drivers, none of whom are full-time employees. Companies like Snapdeal rely on online seller-partners, who’re small businesses. In most of these situations, problems can potentially arise due to disagreements. The role of a watertight contract becomes all the more crucial. We’d strongly recommend having a contract with all key relationships your business has — with employees, partners, vendors, and clients. While the actual nature of the contract will obviously vary, a good contract will be drafted by thinking through all possible scenarios and corner cases, over the long-term. Often, contracts tend to miss out on timelines. For example, if a client says you cannot work for a competitor, as a startup protecting your own interests, you should add a timeline to it and say you will not work for a competitor for 3 months after the current project ends. What should I do when faced with a Cease & Desist Letter? Why Do Startups Need Legal Documents? Is the Service Agreement with your Vendor, watertight?